1. SPRING QUANTITY: COUNT HOW MANY SPRING HOLES IN THE FRAME FOR MORE ACCURACY. 2. 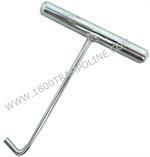 SPRING LENGTH: TAKE A SPRING OFF THE TRAMPOLINE & MEASURE IT; INCLUDING THE HOOKS, TO DETERMINE THE CORRECT LENGTH. UV Protection For All Your Trampoline Needs!